This adventure is set in the city of Punjar, and is intended for a strong level 4 party - some 6-10 characters plus henchmen is suggested. The background sets the scene, explaining how in a three-part adventure the party attracts the attention of the gods themselves and duel with Lord Death himself for their very lives. So, how to set up such a predicament? The driving force for the adventure is a quest to save someone from the clutches of death. In the unlikely event that the party hasn't lost someone recently, a job offer from a nobleman who wishes to get his girlfriend back after some misadventure. Either way, amongst the myriad rumours that fly around a city like Punjar, there's one that claims that the blind Witch of Saulim, who hangs out in Squalor Court, knows of a way to breach the veil between the dead and the living. The first scene involves finding the Witch and learning what she knows. As the Witch - like all fortune-tellers - is remarkably unclear in her proclamations, the party may need a little help to figure out where they need to go. Eventually they ought to visit a temple, steal a particular artefact, and make their way to the charnel pits where access to the realms of the dead is apparently a bit easier than elsewhere in town. It all sounds simple put like that, but of course it is actually quite tricky to accomplish. Scenes are described clearly and evocatively, and the threats laid out well. The temple raid is an adventure in its own right - and in its execution scope for further adventures arises, if you choose to make use of the opportunities. The charnel house is an essay in warped madness. Somehow the party will have to navigate through to reach their goal and accomplish their mission. They can only do that after releasing the blockage that's stopping the souls of the deceased reaching the afterlife... because that's where they, although (for the present at least) still living, must go. It all ends with a game... but the stakes are high. This adventure should live long in the memories of your players, and of their characters should they survive. Adventure on a grand and cinematic scale indeed. 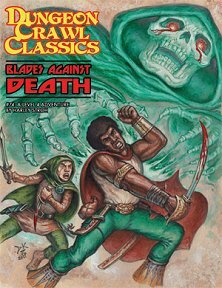 Return to Blades Against Death page.